Jumping rope is one of the easiest and yet most effective exercises anyone can do. Jumping rope will give you a total body workout and build cardiovascular endurance. Custom imprinted jump ropes are a great promotional item that can be used to help children and adults stay active. Jumping rope is also great for eye-hand coordination, agility, and foot and hand speed. 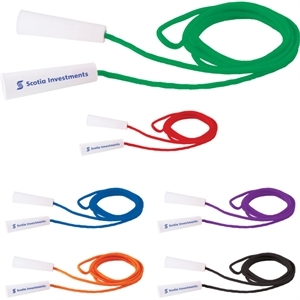 Gyms and other athletic-based businesses should stock themselves with customized logo jump ropes for client use. Personalized promotional jump ropes are also a great giveaway item at trade shows since kids love them too! Custom promotional jump ropes are tons of fun for children, but adults can also benefit from using them as part of their exercise routine. Here at IASpromotes.com, we have many different styles and colors for you to choose from when you personalize these custom jump ropes with your corporate logo and company name. 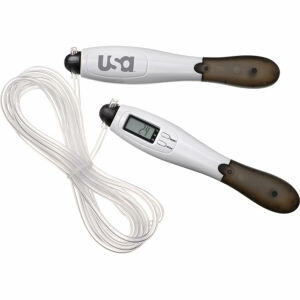 So whether you’re by yourself or with a group of friends, grab a logo imprinted jump rope and get active!